Typically, it’s tough to keep a straight face when reading a positive quote like this from a Cleveland Browns player. Super Bowl? This team? That reaction is usually followed by Googling the man who said it to ensure he isn’t trending for a failed drug test. 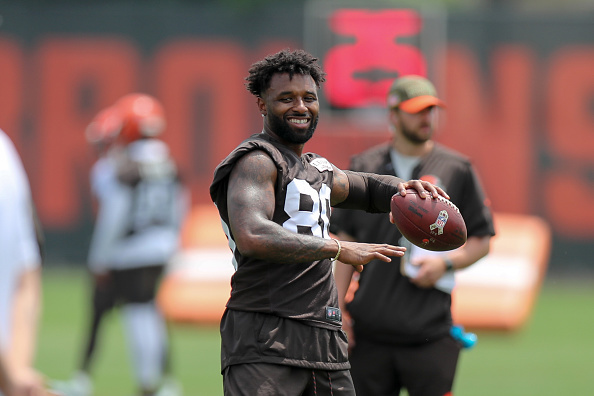 The player in question – wideout Jarvis Landry – hasn’t been subtle about hyping up Cleveland as the season approaches. He’s lauded the current receiving corps (at least before Josh Gordon went on hiatus) and claimed the Browns are a playoff team. This kind of optimism seems laughable on the surface, especially when you consider Cleveland is almost two years removed from its last win. However, Landry’s confidence, as misplaced as some may see it, is more than welcome with this team. It’s going to take a lot to get the Browns back to their winning ways, and it starts with restoring confidence. Landry seems more than ready to help with that cause. Let me set the record straight now – I’m in no way thinking we have a Super Bowl contender in Cleveland. Even the idea of making the postseason feels lofty. A team that’s struggled for as long as the Browns have doesn’t just become elite overnight. However, when you consider what Cleveland has been through over the past couple decades, and especially the last two years, you can’t help but be impressed when hearing someone set such high goals for the 2018 season. The Browns have one win since December of 2015. They’ve looked incompetent on the field and even more so within the front office. Fans were becoming indifferent, no longer wanting to waste their time on a team which didn’t look like it knew how to win. Asking supporters to find optimism with a team fresh off an 0-16 campaign is a heavy request. That said, the moves Cleveland has made since then – including the trade for Landry – have helped win back fan interest despite it recently appearing to be at an all-time low. Now, a few months after signing a lucrative contract extension, Landry is doing what he can to convince Browns fans their days of watching consistently terrible football are in the past. Sure, hearing a player talk about Cleveland winning a Super Bowl seven months after going an entire season without winning a game sounds insane. At the same time, you’re not going to hear me complain about it. This kind of optimism is badly needed, for both the players in the locker room and the fans supporting them. The Browns themselves need to hear something like this after spending an entire offseason recovering from the 0-16 hangover. To head into camp after such a miserable season and hear their talented teammate expressing so much confidence in the year ahead has to be a huge boost. Fans, while likely not making any Super Bowl plans just yet, certainly aren’t going to reject any optimism surrounding the Browns. Their favorite team has been an unwatchable disaster for years on end. They badly need a reason to get excited about football again. In Landry, they’re seeing an All-Pro wideout who’s not only thrilled to be playing for such a historically misguided franchise, but is also taking every opportunity he can to predict big things for the year ahead. Even if you find his claims far-fetched, it’s tough not to get excited about a player having such high hopes for the immediate future, especially when you consider the immediate past. Again, I’m not placing any bets on the Browns winning the Super Bowl this year, regardless of what Landry says. Still, we’re seven months removed from this team reaching peak-misery. That someone as talented as Landry could be this confident in Cleveland’s chances this year is hardly something I’m going to complain about. Obviously, the only way for the Browns to convince us they can contend is by winning on the field. That said, Landry is helping to restore optimism in Cleveland, and at levels nobody thought we’d see after the way last season ended.